Are Dynamic Search Ads Right for Your PPC Account? Dynamic Search Ads (DSAs) are an efficient tool for PPC keyword research and can help advertisers with many different product offerings ensure a high degree of coverage. When optimized properly, DSAs are a useful addition to a well-rounded PPC account. However, when used improperly, DSA ads can open your account up to untargeted impressions and wasted spend. Read on to learn if DSAs are right for you. 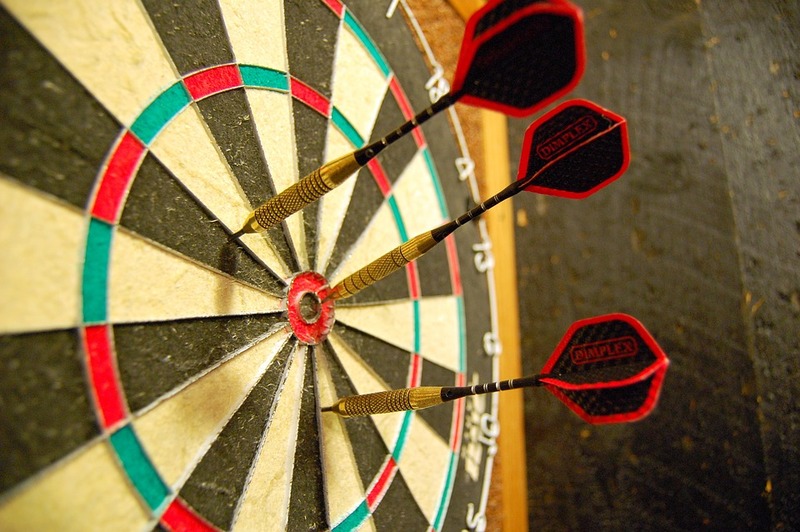 DSAs can hit the bullseye for your target market – or end up off the board. Image via Pixabay. Sounds Cool and All…But What is It? Dynamic Search Ads are AdWords Search campaigns that do not use keyword bidding to trigger ads. Instead, AdWords creates an ad with a dynamically-generated headline and landing page when a search query matches to words or phrases from your website. AdWords generates the ads using the same technology that determines Google’s rankings for organic search results. Let’s take an e-commerce advertiser selling hardware. Building out separate keywords for 5” nails, 3.5” nails, etc., would take a lot of time and effort. With DSAs, your ad, with a dynamically-generated headline and landing page, will enter a larger number of auctions when searchers enter queries relevant to your nails landing page. You will still manually build out new ad groups and campaigns for the most popular nail sizes, while continuing to match to the lower-volume nails terms through your DSA campaign. Is a Dynamic Search Campaign Right for Me? Anyone with a large inventory of products and landing pages, especially large e-commerce advertisers with lots of products. Seasonal advertisers or people who may offer a wide range of changing products. If you are constantly updating your product offerings, DSAs are a perfect way to ensure you maintain coverage on everything. Keyword Research: Though the keyword planner is an amazing tool for generating keyword and ad group ideas, it only provides a certain degree of granularity in its recommendations. DSAs will show you a range of extremely specific longer-tail keywords. Adding these terms to your keyword campaigns can often drive improvements in ROAS and CPA.DSAs also help you stay on top of trends in user behavior. If you’re a shoe retailer, for example, you might notice an increase in searches for Birkenstock sandals, indicating an increased interest in 90s fashion. You could then focus on building additional Search campaigns targeting the Birkenstock demographic. Fast Campaign Setup: Dynamic Search Ads are an extremely fast alternative to manually building out campaigns and ad groups for all your individual products. Because the ad is dynamically generated, you can cover search queries related to many different products in a very short amount of time. Longer, More Targeted Headlines: The DSA’s dynamically generated headline is not bound by Google’s character limits, which allows for extremely specific headlines to match searches. Even with the increased characters in expanded text ads, creating specific ad copy for hundreds or thousands of products is highly dependent on manual SQR research. DSAs excel here because they will match the content of the website to the actual search query. So a search for “three gang white ceramic dimmer knobs” is likely to see an ad with a similar headline, which will stand out against competitors’ “Dimmer Knobs” headlines. Lower CPCs: DSAs are more likely to match to very long-tail search terms, which typically have less competition and are cheaper than their shorter-tail variants. You can bid less on your DSA campaigns and still attract highly-qualified traffic to your website. Just make sure to use negative keywords to exclude the more expensive shorter-tail search terms (that should have their own ad groups elsewhere). Categories: Google will show ads relevant to anything it deems related to a specific category of your website. Page URL: Ads relevant to specific URLs that you select. Page Title: Ads for pages whose titles contain certain words. Content: Ads for pages with content containing certain words. Product Coverage: For many retailers, products move in and out of stock frequently, and it can be really hard to maintain your PPC keyword inventory. DSAs provide a huge advantage in this area, because they allow you to ensure coverage as soon as new products are added to your website. Poor Bid Control: DSAs don’t work so well for companies that only sell a few products. Software advertisers, for example, will likely see poor results from the untargeted bidding and ad copy from DSAs. If you only have one or two products, you’re better off building out highly granular search keywords and ads to allow you to maximize CTR and achieve stronger Quality Scores. Loss of Control: DSAs are great, but you are essentially handing Google the keys to that fancy new car. This doesn’t sit well with a number of advertisers, who prefer to control exactly where their ads are appearing and what the ad copy says. With DSAs, you are trusting Google’s algorithm to match the right queries with the right ads. Chance to Show for Irrelevant Traffic: Though greatly improved, the algorithm used to crawl your website can still match to irrelevant search queries. An auto parts retailer might see matches to searches for specific car models. These irrelevant impressions can result in unnecessary spend on searches that don’t relate to your offering. Aggressive Upfront Maintenance: Initial maintenance and monitoring is required to mitigate unnecessary spend on irrelevant traffic. In the weeks after launch, you should routinely monitor SQRs to exclude irrelevant search traffic via negative keywords. This will ensure you are not showing ads on the wrong search queries. You should also closely monitor your bids to ensure that your DSA campaign is not cannibalizing other search queries. Generic Descriptions: Dynamically generated headlines are great at matching to unique products, but they don’t always represent your business’ Unique Selling Propositions. You are still able to customize the ad description, but you will likely need to use more generic ad copy that applies to a wide variety of products and searches. Because ads with individually customized ad copy are often the best way to achieve high CTRs and conversion rate, overreliance on DSA ads can prevent you from achieving the strongest possible results. Headlines are Not Always Ideal: Your headlines will generally match very closely to the search term, but we have seen cases of wonky headlines that don’t make sense. These are few and far between, but can cause drops in CTR if you are matching to important terms via DSA. If you meet the above criteria, then Dynamic Search Ads are worth a test. In some cases, they can be a huge contributor to account performance. And even with modest performance, you will acquire new keywords to make incremental additions to your existing keyword inventory.